While many “girls” may think they’re the Queen Bee there can only be one in the hive. Many beekeepers buy a queen and a package of bees for the hive in the spring; it’s interesting to know that the worker bees can make a queen. The worker bees clean up the cups or worker cells and make them queen cells. The Larvae is then fed a royal jelly during this stage of development. There are several components of the royal jelly; the last stage includes the addition of honey. This diet along with the hormone called juvenile hormone produces a queen bee. 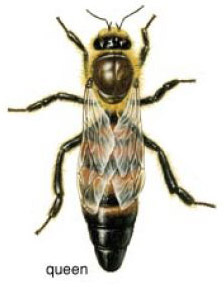 “The girls” also known as the worker bees, can raise a new queen when the queen gets too old or if she is injured. It only takes 16 days to produce a new queen. There can only be one egg producer – the queen – in a hive. The nurse bees feed the queen. She has about 6 – 10 attendants that always surround her, unless she is moving quickly across the comb. The bees feed her brood food or the royal jelly directly into her mouth. This will stimulate the queen’s ovaries and keep her producing eggs. The attendants also clean and groom the queen with their antennae and forelegs. As they do this the attendants collect and distribute queen pheromones. This scent is passed on to other bees in the nest. The average attendant will touch 56 other nestmates in about 30 minutes with her antennae. About six days after the queen emerges from her cell, she puts on her bling and goes on a mating flight. If it’s raining out she will delay her flight. Like any queen would! During her flight, the pheromones will attract male bees from drone-congregating areas (I wonder what that looks like?). The queen will mate with up to ten or more drones over a few days. When her spermatheca, also known as the sperm sac, is filled, she may never leave the colony again unless there is a swarm (Viking tailgating party at the field). After she has mated, the queen is now bigger and heavier (no joke!). She will begin to lay eggs in the hive and will do this for the rest of her life. Well she does get a one month break late in the fall. But she will lay over one thousand eggs a day provided there is enough space and worker bees to incubate and care for the eggs. Over her lifetime “a good queen” will lay 200,000 eggs per year. But her lifespan is two – five years. The pheromones or her scent communicates that the queen is still alive (long live the queen!) and her condition, ( i.e. her health, if she is newly mated or old and failing). Within 24 hours the entire colony will know if it is queenless or if the queen is failing or diseased. Just like the grapevine! A reduction of the pheromone can trigger a swarm preparation or begins the process of replacing the old inferior queen with a young queen. The beekeeper has the responsibility of checking the hive to make sure the queen is laying eggs, and that there are signs of larvae and brood in the hive. It is a delicate process but every beekeeper tries to spot the queen. She has some distinctions but it is not always easy to pick her out of the crowd. While moving the frames and checking for activity the beekeeper runs the risk of injuring the queen. We have learned the hard way that less is best when working in the boxes where the queen is laying. On the other hand, if you don’t check the hive regularly, it can die off without a queen and you can miss finding out that the queen is not doing her job and the hive can become dysfunctional.